In addition to providing guests the unique opportunity of booking date specific tickets, EZ Rez ticket holders will be able to benefit from early entry to “The Wizarding World of Harry Potter™” when the immersive land officially opens on April 7. Early admission to the land will begin one hour prior to park opening. Universal City, California, February 2, 2016 – Starting today and for the first time ever, Universal Studios Hollywood is introducing EZ Rez™, an innovative, easy-to-use online ticket purchasing system featuring an array of new consumer benefits designed to enhance visits to The Entertainment Capital of L.A. as the world-class destination continues its unparalleled investment in an ambitious epic transformation. In addition to affording guests the unique opportunity of booking date specific tickets, EZ Rez ticket holders will be able to benefit from early entry to “The Wizarding World of Harry Potter™” when the immersive land officially opens on April 7. Early admission to the land will begin one hour prior to park opening. 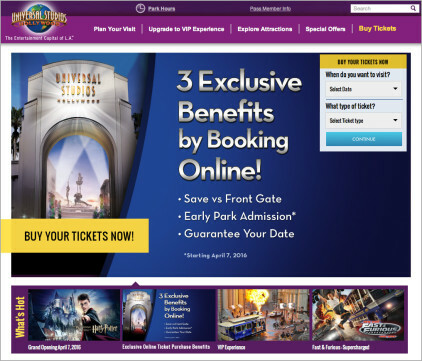 As an added benefit, guests purchasing admission tickets and annual passes via EZ Rez will also enjoy premium savings with all advanced online transactions. Anytime admission tickets will continue to be available. The past five years have been a remarkable time for Universal Studios Hollywood as the destination embarked on an unprecedented revitalization that has substantially altered over 75 percent of its familiar footprint to effectively characterize it as an entirely new experience and theme park. With the much anticipated arrival of “The Wizarding World of Harry Potter™” opening on April 7, and the recent addition of “Fast & Furious: Supercharged” as the grand finale to the world-famous Studio Tour, expansive themed lands including “Springfield” and “Despicable Me Minion Mayhem,” next generation thrill rides such as “Transformers: The Ride 3D,” amplified experiences such as the recently introduced “Nighttime Studio Tour” and the new “Special Effects Show,” Universal Studios Hollywood is continually exploring new, groundbreaking ways to ensure guests have the best possible experience, both in advance and upon their arrival.